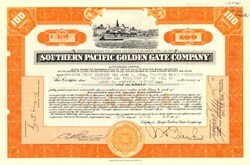 Beautifully engraved certificate from the Southern Pacific Golden Gate Company issued in 1942. This historic document was printed by the Schwabacher-Frey Company and has an ornate border around it with a vignette of a city bordering a body of water with one ship out in the water. This item is hand signed by the Company's Vice President and Assistant Secretary and is over 68 years old. This is the only the second time we have had this certificate for sale. 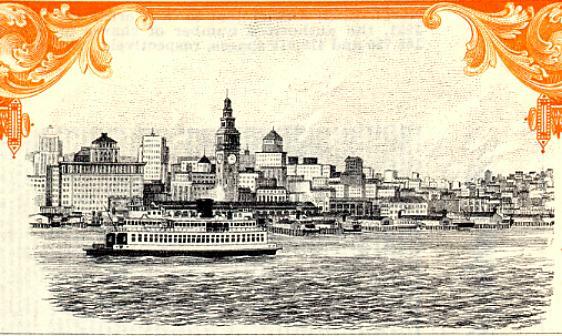 The Southern Pacific Golden Gate Ferries was the largest ferry line in the world, and serviced the San Francisco Hyde Pier � Sausalito route for nine years. The completion of the Golden Gate Bridge and Oakland Bay Bridges initiated the eventual demise of the old ferry boats on the bay.